In the last part of this series, I talked about being resourceful and making the most of what you've got, wardrobe wise. Well this time, I thought it would be appropriate to discuss the background of those (and the following) images. First, I thought this setting would be appropriate for this post, because it is located in a place where the people know quite a lot about making the best of what they've got. This is the Heidelberg Project, which is an open air community art exhibit on Detroit's East Side. 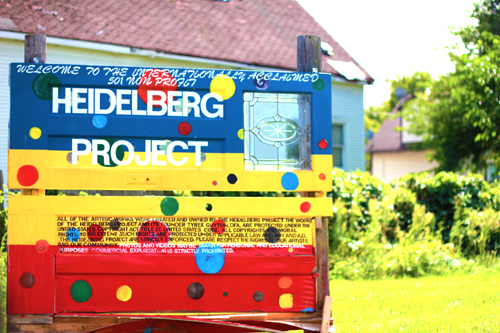 The Heidelberg Project was started by artist Tyree Guyton in 1986 as a response to the decaying community. Dotted with abandoned, collapsing houses, many would argue that the destitute, crime ridden city was a hopeless case. Tyree Guyton along with a few other artists and many members of the community decided to turn the decay into something inspiring. Whether it looks like art, symbolism, or junk to you, you have to admit that it does serve a better purpose than abandoned, caved in houses. It is bringing the community together in a place where all you hear about is how people are killing each other left and right. The Heidelberg Project creates an atmosphere which gets people off the streets and working together to create something very unique and thought provoking. There are many different houses and little "exhibits" involved, made up primarily of reclaimed "junk" found around the city. Below is the Polka Dot House, which Tyree inherited from his grandfather and remains a focal point of the community's aesthetic. There is a fence covered in all types of shoes, a speed boat filled with stuffed animals (Noah's Ark), a house covered in pennies, a house covered in records... the list goes on and on. The beauty of it is that it's up to the viewer to make sense of it and decide what it all means. The Heidelberg Project is one of Detroit's top tourist attractions, bringing in around 275,000 visitors each year from all over the world. 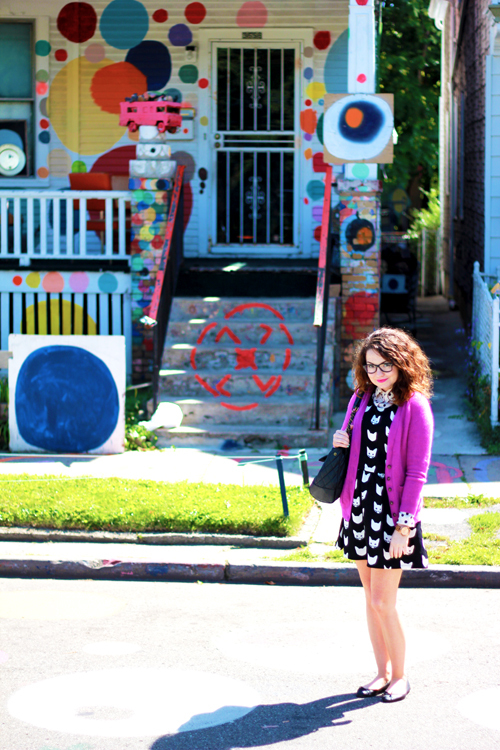 Whether inspiring people to think about art, community, politics, or just to create a wacky, quirky outfit mixing cat print and polka dots, the Heidelberg Project is serving a viable purpose in a place that no doubt needs some repurposing. What are your thoughts on this? Would this be something you would be interested in visiting? What an awesome exhibit! I would absolutely love to see this. 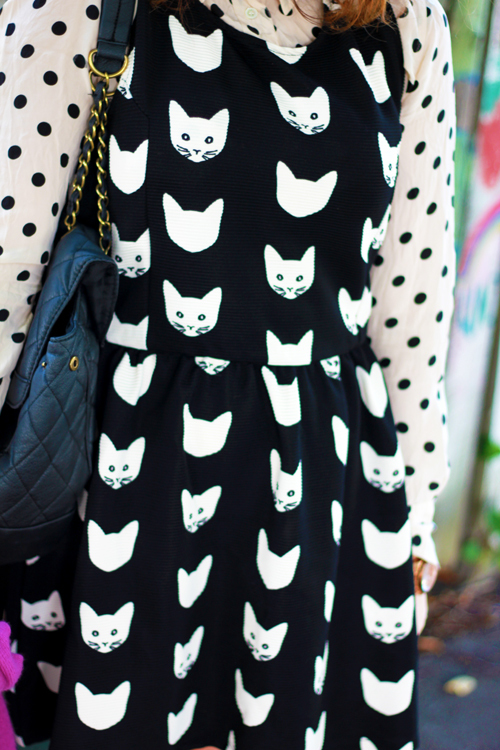 Your cats + polkadot combo is too cute! Thank you! And a house covered in polka dots?! Isn't that just perfect? You're so cute; I love your look! Stopping by from the GFC Collective, and I'd love for you to drop by my blog if you get the chance. Have a great week, lady! I've been seeing that cat print dress eeeeverywhere, and i have to say your styling is by far my favorite so far! i LOVE how you paired it with a polka dot blouse underneath, and then that pop of purple is just brilliant. i wish i was wearing this same outfit right now, haha! Obsessed with the pattern mixing!